A portrait of a medieval samurai who, while being a warrior, also loved poems. 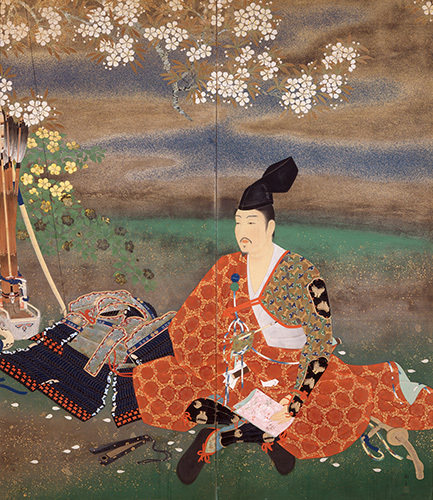 A warrior with his armor removed is sitting with a writing brush and paper in his hands. Above him, mountain cherry blossoms are in full bloom. This is Taira Tadanori, provincial governor of Satsuma, who was killed in the Battle of Ichinotani amidst the Genpei War. Although Tadanori was born to a military family, he excelled in Japanese poems. The poem “Mukashinagara no yamazakura kana (The mountain cherries as of old! ),” which he entrusted to Fujiwara Shunzei when fleeing from Kyoto, was included in Senzaishu, a collection of poems, as an “anonymous” poem. It is said that at his last moment in Ichinotani, there was a strip of paper inscribed “Hana ga koyoi no nushi naruran (Flowers are the master this evening)” and the warrior dressed in expensive brocade was identified as Tadanori. In the yokyoku (noh song) entitled Tadanori, under a mountain cherry tree planted where he died, Tadanori’s departed soul complains to a traveling monk how he resents his poem being marked “anonymous”. This painting is densely colored employing gold and silver and depicted according to meticulous research on warriors’ costumes. It represents the subtle and profound world of the Minamoto and Taira clans.